The National Highway Traffic Safety Administration (NHTSA) has conducted 2 recalls, 0 investigations of reports of a defective product, and recorded 0 safety complaints filed against this vehicle. Acura has manufactured models of ZDX 4WD for 4 years. They average 19.0 combined miles per gallon, with the latest 2013 ZDX 4WD above average at 19 combined MPG. 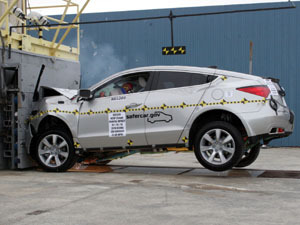 Government regulators estimate the fuel cost of the 2013 ZDX 4WD to be $2,400 per year. This estimate is based on 15,000 miles driven, 55% city driving and 45% highway driving, and premium gasoline. Compared to other vehicles, you spend $5,000 more over 5 years compared to an average vehicle. The ZDX 4WD consumes about 17 barrels of petroleum per year, according to the standard estimate of 15,000 miles driven. Most of the world's petroleum comes from countries like Russia, Saudi Arabia, the U.S., and Iraq. The ZDX 4WD emits 482 grams of CO2 per mile, or roughly 7,230,000 grams per year. To put this into perspective, a normal tree absorbs about 21,000 grams of CO2 per year, so about 344 trees would offset these emissions. The ZDX 4WD does not have start-stop technology. 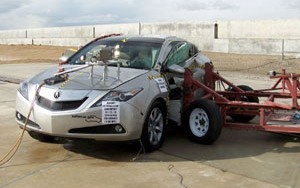 The Acura ZDX 4WD has 4 different model options on record with the EPA since 2010. For the most accurate MPG estimates, find your exact model below.